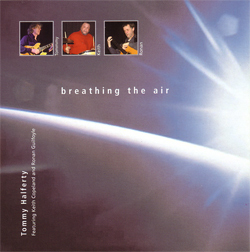 This is Tommy Halferty’s latest solo album to be released very soon. You can preview this album by listening to the sample tracks below. A review of this album will be added soon. There is currently no information available for the album "Tommy Halferty Trio Live at the Wellington 2006", please check back soon for updates. This performance brings together some of Ireland's leading jazz and traditional musicians with these Indian masters, forging a dynamic language that transcends language and borders. Drawing on the melodic strength of Irish music, the rhythmic character of its Indian counterpart and embracing the improvisational instinct of jazz, this proves to be an exhilarating musical dialogue, climaxing in a performance of 5 Cities, a collaborative piece written by the musicians while on tour in India. This album is the first in a series of two that combine a few different streams of music. Khanda was released under the Improvised Music Company (IMC) Records Label in 1997. A great World Music Project in the real sense. The best mix of Irish, Indian and Jazz ever done! Everyone is a musical equal here.